Biodiversity and Conservation including population and community research, conservation and ecological indicators. Research in this theme is dedicated to knowledge and capacity development pertaining to a better understanding and conservation of freshwater and estuarine aquatic fauna. Our focus region is Mpumalanga and KwaZulu-Natal but also South and Southern Africa, which has a rich diversity of freshwater animals that is poorly understood. Many vertebrate and invertebrate species complexes are currently being unpacked and the AER is a prominent contributor to this field of study. 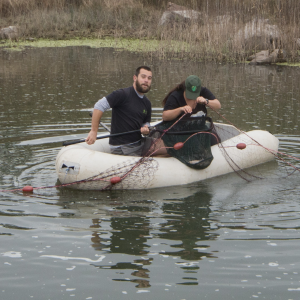 Within the team, we have been working in many rivers, estuaries and wetlands throughout the province and have been collecting and evaluating genetic material and species population wellbeing. The AER has established an aquatic invertebrate and fish collection which is closely associated with existing national collections. The AER works extensively with fish and other aquatic animals as test organisms. Céline Hanzen is the theme leader. She’s a Senior Researcher within the AER programme and conducts her PhD through UKZN. 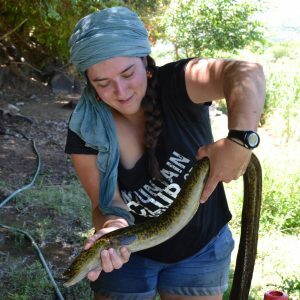 She focus on freshwater eels : their distirbution, genetic and spatial ecology. She has a keen interest in issue associated with fish movement, migration and river connectivity. 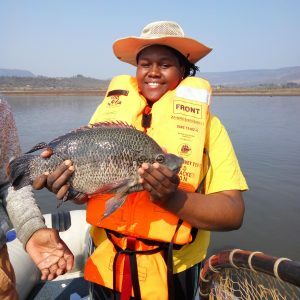 Her research also overlaps with the “Fisheries” theme as she is involved in the Fishtrac programme and as she is conducting some spatial ecology studies herself. Read about her research here. Mahlatse Fortunate Mashaphu is a Junior Rearcher within the AER programme and conducts her MSc through UKZN. She focus on the Mozambique Tilapia, Oreochromis mossambicus in KwaZulu-Natal. She is interested in the conservation of this threathened indigenous species through the use of genetic. She is also very interested in the development of aquaculture in South Africa. David Phiri is one of our tehcnician. He’s been involved in many projects in our different research themes including fish ans SASS sampling. Camille Fritsch has been helping on different projects including Céline’s catchment scale sampling for eels and Matt’s tagging study. 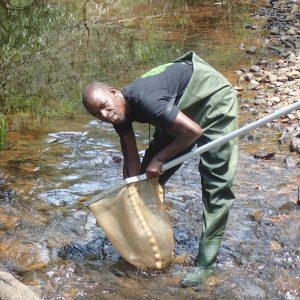 He is currently finishing his MSc with Prof Downs Lab where he’s looking at hippo conservation, behaviour and ecology in Ndumo in Northern KZN. Camille also had an important role in making the Duzi Gold mini serie ! Other team members are also involved in this theme : Mbali Sosibo, Jen Cele and Pumla Dlamini.